Mardi Gras! - Events - ACF Chefs de Cuisine Association of St. Louis, Inc.
Screen 1 Select "SIGN UP YOURSELF" Select "ME ONLY" then "GROUPS OF 10"
While our website is very sophisticated, it is not set up for signing multiple guests up at one price under a host name. Sorry for any confusions along the way. If you have further questions, please don't hesitate to contact chefmbush@meabrk.org. Please inform your guests when arriving at event to say they will be a guest at the host names table. 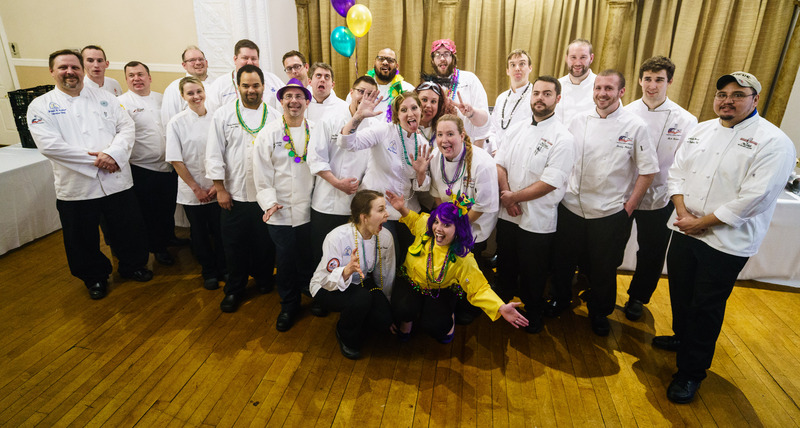 Join us for the annual Chef's Culinary Mardi Gras Fundraiser -- a culinary extravaganza to celebrate Mardi Gras in grand style with music, dancing and an evening full of surprises! We are cordially inviting you and your guests to this culinary extravaganza. The cost of admission is $45.00 per person for members and guests; $35.00 for junior members. Tables of ten can be purchased for $400.00. All proceeds will be used to fund culinary arts scholarships and junior culinary competitions. Mardi Gras costumes are encouraged and there will be prizes for the top three costumes. Top prize is two tickets to the American Academy Chefs Dinner in March. Also, there will be a POT OF GOLD drawing at the end of the night. Tickets can be purchased individually or for tables of 10. Junior members receive a discount on their ticket. All proceeds will be used to fund culinary arts scholarships and junior culinary competitions. Any assistance you can provide in the way of time, talent, expertise, food donations or items for the silent auction will be greatly appreciated. Please contact Bob Colosimo at 314-241-9999 or bob@1111-m.com for any of the above contributions. Your continued support in all of our events is greatly appreciated.